I was walking around a big marina the other day and saw Matt Rutherford’s Vega. recognized all the stickers all over it immediately. I believe it’s still for sale for anyone interested. Keep an eye out for the Golden Hind IV. Albin Vega 2749. currently being refit in Ladysmith BC, Canada and will begin its circumnavigation in 2016/17 skippered by James Howard. I just became the proud owner of Vega nr 0203! Lot of work remaines, but with soul and personality!! pics will follow! Ahoy, let me share my story with you. The Albin Vega Trans-European Challange starts at Veere (NL), and ends at the lake Balaton (HUN). I am doing this trip on the board of my Albin Vega (2611), built in 1977. With this challenge I would like to commemorate my grandfather. During WW2 my grandfather and his brother were taken by the nazi army to Germany. They were only children that time. My grandfather had managed to escape and later he returned to the camp to save his brother as well. The two of them paddled with a stolen punt all the way down on river Danube back to their hometown in Hungary. This trip was his first big experience on the water. He had started his long career in 1947 as cabin boy and ended it in 2001 as captain of his own pleasure boat, where he had a heart attack while docking. His expertise was recognized even by Mr Jacques Cousteau. The world wide known scientist asked my grandfather to be his guide at the exploration of the Danube’s wild life. Follow my trip on Facebook, where I will publish every day’s accomplishment. Be part of the challenges, I will need a lot of positive thoughts during the 30 days :). See you on Facebook! Refit. I would be very greaful of any advice I can get. I am looking for a set of plans to build a wooden cradle if anyone can help ? I just purchased my Vega S/V Viking, Hull 3361 in July 2013. She is nearly all original. And because of that she needs some updating. 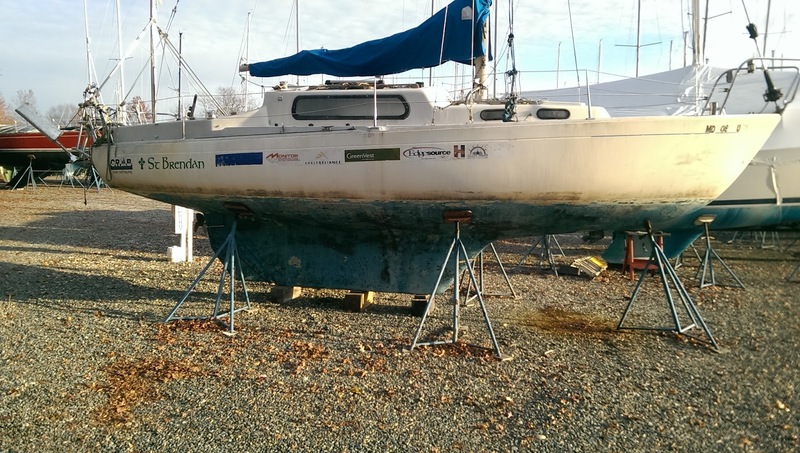 Although with just two days of fitting out she motor sailed over 500 miles from Annapolis MD. to Charleston, SC. in 11 days. If anyone knows of Viking and her history please email me. There’s this guy, Matt Rutherford, who completed a circumnavigation of the Americas on his Vega in the spring of 2012. Coming to U.S Public Television in April 2016 sponsored by Honda. The voyage earned Mat two Guinness World records. Actually, the Vega did have wood inserts in the core in areas where hardware would be attached (grab rails, turning blocks, foredeck cleat) and some mixture of polyester resin and vermiculite was used beneath the toe rails, hatch frames and maststep. More details can be found in the original owner’s manual at the Vega website. I’m surprised to read about plywood coring in the deck and cabin top. I thought that the core material was divynlester foam. I installed some coachroof hardware this year and saw no evidence of wood in the layup in this part of the boat. For an illustrated account of the 1985-89 circumnavigation of the Albin Vega Tarka the Otter (Victoria, Canada) please see http://www.bosunbird.com/page14.php .